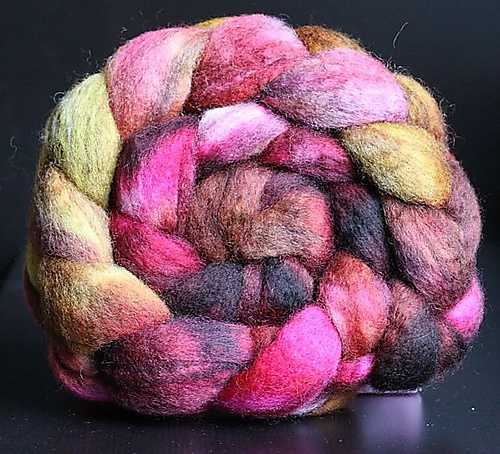 Two years ago, when I started spindle spinning, I signed on for Tour de Fleece, a Ravelry event that takes place during Tour de France where we spin the same days that the riders do. I got through a 50g merino sliver in the first three days, and started on a 115g braid of Mixed BFL from Two If By Hand in an interesting pink and gold colourway called “Blooming Bougainvilla”. 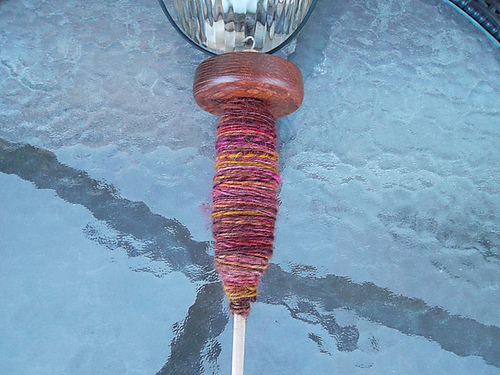 I got 9 or 10 days into TdF and fell off the wheel, so to speak, with about a third of the braid on my spindle. My Houndesign spindle…as pretty as the fibre! And so it has sat in my crafting cupboard for the past two years. With my renewed interest in my wheel, I decided I’d probably never finish this on a spindle. But why couldn’t I finish the braid, but on my wheel? Since there’s only a third on the spindle, if I spun the other two thirds on the wheel, the amounts would be uneven and make for weird and awkward plying. So what’s a girl to do? I’ll tell you…she spends an entire episode (and then some) of Scandal winding the spun yarn off her spindle onto her wheel, then attaching some new fibre to it and continuing the effort. And off we go, albeit a little blurry! The yarn is significantly thicker than my current spinning so it will be a task to keep it that way. And if I choose to chain ply, that resultant yarn is going to be quite thick. 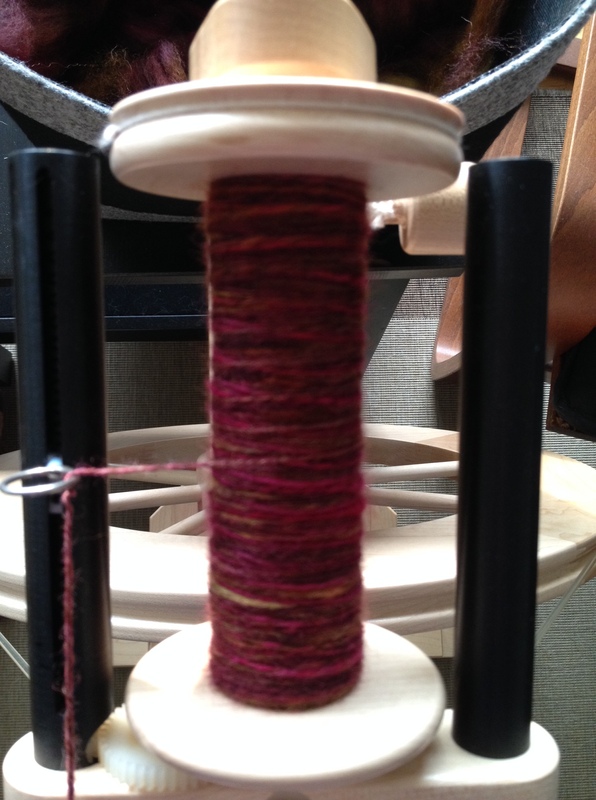 Here’s the most interesting part…looks like I spin in the opposite direction on my wheel than I do on a spindle. With the spindle, I push off the inside of my left leg, this causing the spindle to go counter-clockwise, resulting in an “S” twist. With the wheel, I default to pushing the wheel clock-wise, resulting in a “Z” twist. So for the next few days, I have to remember to spin my wheel as though I were plying, instead of my usual way. But at least a two year old spinning project will get finished. What old projects have you resurrected because you got tired of knowing they were just sitting there? This entry was posted in Uncategorized and tagged BFL, fiber, fibre, handspinning, lendrum, mixedbfl, roving, spindle, spinning, top, twoifbyhand, woolee winder by Rayna. Bookmark the permalink.